* By January 1, 2006 the percentage of an automobile that can legally be used as landfill must drop form the current levels to 15%. Within the remaining 85%, 80% must be recycled or reused. The last 5% falls under the rubric of "energy recovery," which means it is burned or converted into energy using some other method. * By January 1, 2015, the percentage that can be disposed of in landfills drops to 5%, with the amount that must be recycled or reused rising to 85% and the remaining 10% eligible for energy recovery. Paul Berthevas, senior development associate, Polyurethanes, at Dow Europe S.A., says, "To meet the 2006 regulations, approximately 100 lbs. will have to be recycled over and above what is being done today. Not only will technology have to be developed to recycle this, but markets will have to be found. This is a huge challenge. Much bigger than most people think, and the biggest challenge is economic." There are some clear ramifications of these regulations on the European auto industry. Since the rules stipulate that a majority of the cost of compliance must be borne by automakers, OEMs are already starting to set aside large sums of money to offset this future cost of doing business. And since they are at the top of the food chain, suppliers and the end customer will probably end up bearing some of the costs. This puts the plastics industry in a triple bind. On the one hand, it will have to incur the research costs associated with developing products that can be more economically recycled. On the other it could find its margins squeezed an automobile that can legally be used by OEMs looking to compensate for the regulations' cost. And third, it may be that plastics use will simply decline as automakers start delving deeper into exactly where each part will end up. 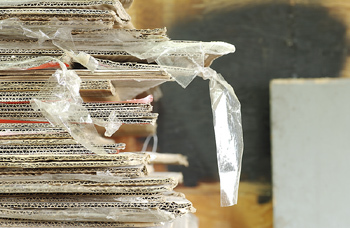 The forthcoming rules are also focusing attention on whether disassembly or shredding is the most efficient way to collect parts for recycling. Disassembly requires a lot of labor, and even with increased efforts by automakers to design vehicles to be disassembled easily, the fixed labor costs of this option are not likely to change significantly. The advantage is that parts are disparate and require minimal sorting before recycling. Conversely, shredding is largely automated, but separating and decontaminating the different materials in the ASR is a major headache. Meanwhile, Back in the U.S. of A. In the U.S., such regulations aren't in place. Yet. But there are concerns regarding handling end-of-life vehicles, concerns relating to the economics of recycling. Claudia Duranceau, senior research engineer at Ford and long time participant in the United States Council for Automotive Research's (USCAR) Vehicle Recycling Partnership, puts it this way, "We have been working with the infrastructure for the last 10 years. We have done a number of studies, we have done pilot collections, and dealt with issues like how you get around parts that haven't been marked, how you process them, how do you get enough material and how much is enough material, what are the incentives in the industry-and the same issues keep coming up, transportation, volume and moving air. And for what someone would be willing to pay there is not an infrastructure." Or whether anyone wants to pay. Duranceau says, "Our surveys have shown that customers won't pay extra for being friendly to the environment. They expect it at zero cost." In fact, she says, there is a certain amount of suspicion among the car buying public about using recycled materials at all. The attitude is basically one of "Why are you putting used materials in my new car?" And because there is currently no real economic incentive to use recycled materials, even automakers that are trying to push the envelope on recycling often find themselves falling back on the tried-and-true. Ken Rusch, technical programs manager, The Budd Company, Plastics Division, (Troy, MI) explains, "The plastics industry is seeing some mixed signals right now. When you are early in a program, recycling is held up high as an objective. Then, everything is over budget, they're trying to reduce the cost and investment, and minimize the number of new tool parts, and what happens is that very often the recycling objective tends to get second priority. So, there is a tendency to repeat the current design." That said, he thinks that recycling will get a higher priority simply because parts made with SMC (Sheet Molded Compound) and RRIM (Reinforced Reaction Injection Molded) materials are easy and economical to recycle when used in quantity. One way to simplify the recycling process is to reduce the number of plastics used in vehicle production. Bruce Cundiff, director of automotive programs at the American Plastics Council (APC), says there are 39 different plastics on cars today. Using fewer types of plastic could reduce the amount of work needed to separate parts or ASR. The down side to this approach is the potential loss of flexibility and functionality. According to Ken Rusch, the move toward greater recyclability "has tended to minimize the use of special plastics and blends, it has minimized some of the approaches toward hybrid [e.g. bonded plastic/metal] and composite designs because those are seen as harder to separate." Ultimately, the advances in reducing end of life waste that will likely come because of the EU's legislative fiat, have the potential to benefit recycling efforts in the U.S. But a cost-effective market for recycled plastic is what is most needed and that cannot be conjured by a regulation.